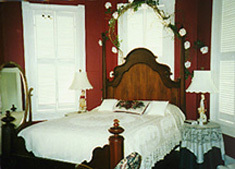 This room calls for romance of any kind, a Honeymoon, Anniversary, or a special Birthday. 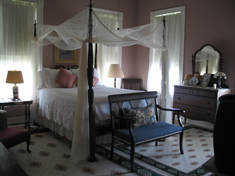 This lovely Victorian room has a grand queen size bed, antiques, sitting area and a beautiful romantic bathroom complete with an original claw-footed bathtub. A Champagne Basket can be arranged to celebrate a special occasion. Emile Daboval’s son, Tippy would have loved this room. A separate sitting room with a loveseat, tv, and desk makes it the perfect room for a couple and child.This downstairs room has a queen bed and a large private bath. The Royers love to tell the story of Lena, the maid, who lived here during WWII. 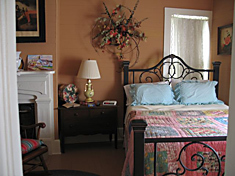 This two bedroom suite has two double beds and a bathroom with a claw-footed bathtub open to one of the rooms. Lena's room is upstairs with access to a refrigerator and a phone. A TV with a remote is also furnished. 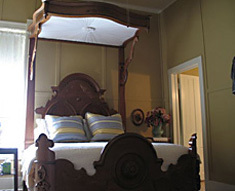 Use the footstool to reach the grand four-poster queen bed in this elegant room. 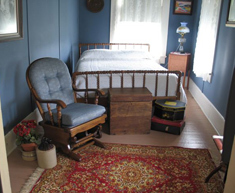 Mrs. Besse’s room has her original dresser, beautiful accessories and a private bath. The room is furnished with a TV/Cable and remote.This upstairs room faces the front of the house, and you can slip onto the second story front porch at night and watch for the train. This is a perfect room for the single visitor. A little smaller than the rest, it faces the front porch and the passing train can be seen from the window. It has a full bed, and a private bath with a large claw-footed bathtub. The decor celebrates the Southern Pacific Railroad and days of a traveling salesmen. The downstairs parlor is for guests to mingle or relax. Coffee is served here every moring before breakfast. Guests can stop by in the evening for a glass of wine and listen to the victrola.